Systematic and explicit phonics instruction is a key component of effective reading instruction. Knowledge of letters and their sounds is essential. Research studies report that systematic and explicit phonics instruction significantly improves word recognition, spelling, and reading comprehension. 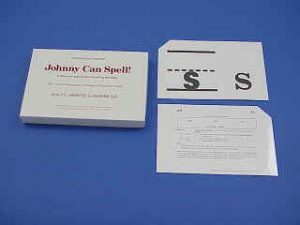 The Phonogram Page, a free service of Johnny Can Spell, is designed to promote phonics and handwriting awareness, parent involvement, and student mastery of the 70 common phonograms of the English language. N.I.N.E. Enterprises, Inc. was founded in 1987 by Alice Nine to support excellence in education. Since then, N.I.N.E. Enterprises has sponsored hundreds of literacy training events nationally and internationally for educators, parents, and interested people. Alice Nine firmly believes teachers and parents must have thorough knowledge of our language and appropriate strategies to teach our children sequentially the subskills of writing and reading. To that end, N.I.N.E. Enterprises offers training and materials. Once students have been introduced to the sounds and symbols of English, it is necessary to begin to blending and segmenting by decoding and encoding words. For this reason, N.I.N.E. Enterprises is currently developing SpellDrill.com, a daily spelling session. Anyone learning to read, write, or speak English profits. Children and adults alike benefit from the phonics practice provided by PhonogramPage. People around the globe use it daily. What is Johnny Can Spell?